October of 2013 brings two smartphones with a new technology i.e sports a flexible display screen. The first was Samsung Galaxy Round and now another mobile phone added to the smartphones which features a flexible display By the Samsung Rival LG. Yes we’re talking about the most recent mobile phone announced by the South Korean manufacturer that is “ G Flex”. The main difference of Galaxy Round and G Flex Curved display is that the new LG G Flex screen is curved vertically while the Samsung galaxy round featured horizontally curved screen. There are also some other new and good looking features that the new LG G Flex have. LG G Flex featured a 6 inch Full HD curved display, 2GB of RAM, 32 GB of inbuilt Memory, a 3500 mAh powerful Battery, runs on android 4.2.2 jelly bean, the new smartphone sport a 13MG of rear camera while 2.1 mega pixels of a front-facing camera is also sports in. Read Full specs and features below. Qtheatre: Qtheatre feature in LG G Flex lets users have a quick access to photos, videos, and youtube by touching the lock screen with two fingers and dragging them outwards. It means you will be able to do even the screen is locked. Dual Window: As the name implies, this feature will be used for multitasking, This divides the screen in the two windows so you will be able to use two different apps simultaneously at one screen. Swing Lock Screen: swing lock screen alters the lock screen image depending on how the mobile phone is held by the user. Face Detection Indicator: The feature displays a green LED on the rear key to confirm face and focus. Urgent Call Alert: A red color led will be start blinking on rear key whenever several consecutive calls of a person got unanswered. Memory: Having 32 GB of Inbuilt Memory. Display: G Flex spots 6 inch full HD Curved screen, with 1280 x 720 resolution. Processor: 2.2GHz quad-core made of snapdragon 800. 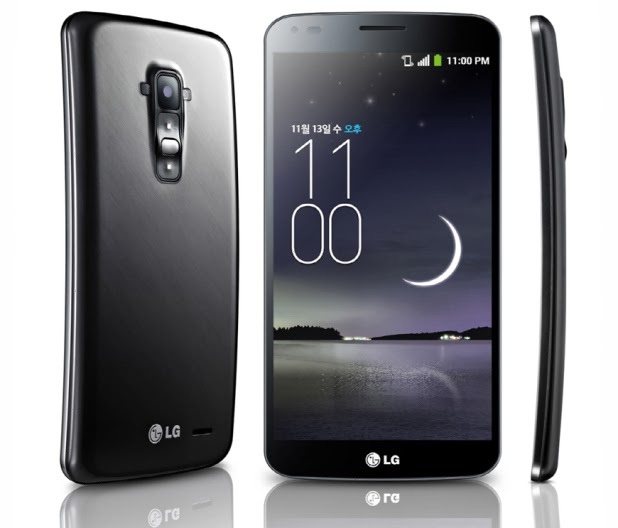 Camera: LG G Flex has a 13 mega pixels of primary camera with 2.1MG of front-facing camera. Network and Connectivity: If we talk about the Network and connectivity then LG G Flex comes with 4G LTE/LTE- Also a network along with Bluetooth 4.0/ Wi-Fi 802.11 a/b/g/n/ac and NFC under connectivity.